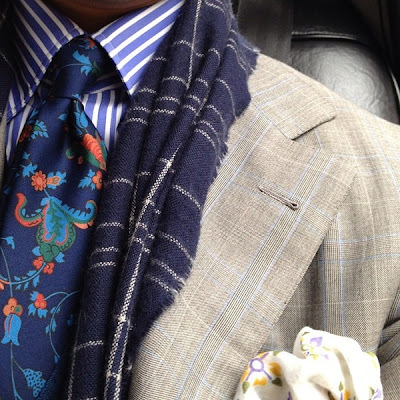 For many, this combination of colours and patterns will be too strong for any occasion, no matter how light hearted. But take out one or two elements – such as the tie, or the scarf and handkerchief, and there are important lessons here for everyone. Dandies can lift the look wholesale. Strong patterns need to be set alongside others of a dissimilar scale. So despite the strength of the butcher’s stripe on this shirt, the tie works because its pattern is larger. The jacket bears a far smaller, subtler pattern, while the handkerchief is similarly subtle but worked on a larger scale. Nothing clashes from similarity and proximity – except perhaps the scarf, which succeeds through the plainness of its decoration. And perhaps the sheer audacity of adding one more decorative element. In terms of colours, most items here are dominated by a blue or lilac ground or pattern, which ties them together. The pale yellow of the handkerchief, meanwhile, picks up the yellowish cast of the grey glen-plaid jacket. I love this outfit for its mastery of pattern matching (if four is said to demonstrate expertise, five must surely show mastery) and harmony of colour. It’s worth bearing in mind, too, that some of these items on their own, such as the tie, would struggle for context. I’ve never liked paisley ties like this for that very reason. This outfit might change my mind. Picture courtesy of The Armoury. You can follow the discussion on Combining pattern and colour in shirts and ties by entering your email address in the box below. You will then receive an email every time a new comment is added. These will also contain a link to a page where you can stop the alerts, and remove all of your related data from the site. From my perspective, I would prefer a solid light blue or white shirt instead of this striped one. So that the two accessories could have a better background to shine. There are too much stripes in this outfit. I love this combination – risky but it works and as you say Simon – Mastery. However, i would like to see the whole outfit to make a final judgement as it would put the outfit in to context. So any chance?